Brick & Tile Paint Matt Red for stone, concrete, plaster, render, & bricks. 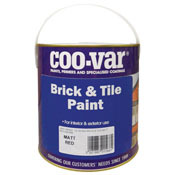 Coovar Brick & Tile Paint Matt Red. Improves and protects the facade of brick property. Provides a flat "brick" red finish to stone, concrete, plaster, render, bricks, etc.